As mentioned in footnote ten along this story, the Ōtenta-Mitsuyo was one of the “Five Great Swords.” Sttaight away, the name Ōtenta (lit. “the Great Tenta”) comes from the name of the smith, which was written in old sword documents and meikan records with different characters, for example 伝太, 伝多, 転多, 典太, 典多 oder 田多. Accordingly, also the quoting of the sword´s name can be different. The Maeda family used the characters 大伝太, the Kyōhō Meibutsu Chō the variant 大伝多, and the certificate of its designation as national treasure writes the name with the characters 大典太. In the last chapter we have read that Mitsuyo is traditionally dated to the Shōhō era (承保, 1074-1077), or that is to say the first generation, because until the middle Muromachi period, several smiths with the name Mitsuyo were active. *1 But the late Heian period is incompatible with the workmanship of the earliest Mitsuyo blades. It is more likely that the first generation worked 80 to 100 years later, because with the starting Genpei War (源平合戦) between the Minamoto (源) and the Taira (平), also in the remote provinces of Kyūshū*2 an increased demand for weapons was given. The fact that several Mitsuyo smiths were active over the centuries probably resulted in the name Ōtenta chosen by the Maeda family because they wanted to refer of course to the legendary ancestor of this lineage. Another theory says that there was maybe another, shorter Mitsuyo blade in the possession of the Maeda family which was then called Kotenta (小伝太, lit. “the small Tenta”). But neither such a blade nor records on such a blade are found in the bequests of the Maeda clan. The origins of the history of transmission of the Ōtenta-Mitsuyo go back to the time of the Ashikaga Shōguns as it is recorded that it was – together with the Onimaru-Kunitsuna and the so-called Futatsumei-Norimune (二ツ銘則宗)*3 – one of the three treasure swords of Ashikaga Takauji which were handed down from shōgun zu shōgun. Yoshiteru (義輝, 1536-1565), the 13th Ashikaga generation after Takauji, presented the three swords to Toyotomi Hideyoshi for his great achievements in unifying the country. The following story is about how the Ōtenta-Mitsuyo went from Hideoyshi to the possessions of the Maeda family. It is the fourth year Bunroku (文禄, 1595) and Hideyoshi invited to an important meeting at his Fushimi Castle (伏見) near Kyōto. The exact reason for this gathering is not recorded but probably some questions were clarified about his nephew and vassal Hidetsugu (秀次, 1568-1595) who caused as regent (kanpaku, 関白) a considerable stir. Another reason could have been plans for the second invasion of Korea which should come to nothing two years later, of course partly due to the death of Hideyoshi. However, the meeting must had been of a certain importance because the “Who´s Who” of Hideyoshi´s generals and military commandes attended, for example Maeda Toshiie (前田利家, 1537-1599), Katō Kiyomasa (加藤清正, 1562-1611), and Kuroda Nagamasa (黒田長政, 1568-1623). When the participants prepared for a staying awake all night long (yotogi, 夜伽) to protect Hideyoshi, they started to tell each other horror stories. One such a story was about that a vassal of Hideyoshi tried to pass during the night along the corridor to the great salon of the castle, when suddenly something or someone grabbed the end of his scabbard (kojiri, 鐺 oder 小尻) and hindred him from walking on. The man was not able to free himself from this force and make a single step towards the direction he took and had to return. The oldest of this round – Maeda Toshiie – rose to speak and brushed the story aside as nonsense. Such stories are told at all times to give an explanation to one´s cowardice he said. “Well, than the honourable Maeda should have a try!” said one of the men who was obviously annoyed by Toshiie´s affected behaviour. One word followed the other and soon Toshiie was unable to make excuses. “Fine, let´s do it! And I will leave a sign at the end of the corridor that the good men do believe me.” Katō Kiyomasa, who could have been the son of Toshiie, regarded this as the high spirits of an old man but handed him over his fan: “How about this fan as a proof of evidence?” Toshiie took the fan with all formality and left the room. The discussion about the „test of courage“ made the rounds among the servants and even reached the ears of Hideyoshi who sent for Toshiie. He smiled and said to him: “Younker Mataza (又左),*4 if you really want to do that, better thake this“, and he handed him over his Ōtenta-Mitsuyo. With this sword Toshiie does not need to worry because it is animated by a mysterious power. So Toshiie walked courageously down the corridor but nothing happened – it remains an open question because of the sword or because it was just a silly ghost story. At the end right at the entrance to the saloon he placed the fan of Kiyomasa and returned to his men. The end of this story is that Kiyomasa was deeply impressed by Toshiie´s courage, another blade of Mitsuyo had proven that it owns magical powers, and the sword in question became officially the property of Toshiie. So far this legend but the Kyōhō Meibutsu Chō mentions another one how the Ōtenta-Mitsuyo came to the Maeda. Toshiie´s fourth daughter Gō (豪, 1574-1634) has always been sickly but when she was going to marry Ukita Hideie (宇喜多秀家, 1572-1655) – daimyō of Bizen and member of Hideyoshi´s “Elder Group of Five” (go-tairō, 五大老) – she was once more afflicted by a mysterious fever. Hideyoshi thought that she was cursed and intervened: He offered Toshiie to borrow him his Ōtenta-Mitsuyo so that he was able to use it as defence against evil forces and place it near the cushion of his daughters sickbed. Toshiie accepted this offer gratefully and indeed, Gō´s problems diminished. When he returned the sword to Hideyoshi she suffered a relapse, the sword was sent back, and the whole game was to be repeated three times. Finally Hideyoshi suggested that it would be best that Toshiie just keeps the sword. Later it was said that Toshiie used the sickness of his daughter as a pretext for getting the Ōtenta-Mitsuyo. And in the records of the Maeda family we find a slightly different version of this story. It mentions that the Ōtenta-Mitsuyo went before from Hideyoshi to Ieyasu, who on the other hand passed it on to his son Hidetada when he succeeded as second Tokugawa-shōgun. Hidetada adopted Maeda Toshitsune´s (前田利常, 1594-1658) oldest daughter Kametsuru. *5 When she felt ill one day and even the best physicians of the Maeda fief were helpless, it was thought once again that she was cursed or that demons were at work. Thus Toshitsune asked Hidetada for the Ōtenta-Mitsuyo to place it close to Kametsuru´s sickbed. She recovered and – you guess it – the story repeated several times like mentioned above, until Hidetada agreed to leave the sword permanently in the possession of the Maeda family. The Maeda kept the Ōtenta-Mitsuyo together with a sword of Kokaji Munechika and a naginata of the Shizu school*6 in a black lacquered chest over which a shimenawa (注連縄, a sacred shrine rope) was put up. The treasure house which was especially built for these swords was later called karasu-tomarazu no kura (烏止まらず の蔵), lit. “the treasury on which the crows never land.” This too goes back to the magical powers of the Ōtenta-Mitsuyo. In the ninth year of Kanbun (寛文, 1669) the Maeda family ordered Hon´ami Kōho (本阿弥光甫, 1601-1682) to make a mounting (koshirae, 拵) for the Ōtenta-Mitsuyo, namely in the same style as the koshirae of the Onimaru-Kunitsuna, that means a leather covered scabbard and a protective leather cover over the tsuba (see picture below). Since that time no one except the actual head of the Maeda family was allowed by an house interal law to touch the mentioned swords. The law prescribed further that the blades had to be looked after and eventually cleaned on a certain day, also only by the head of the family. koshirae of the Onimaru-Kunitsuna top, those of the Ōtenta-Mitsuyo bottom. It seems that this law was not so strictly applied because we know of records where Yamada Asa´emon Yoshimutsu (山田浅右衛門吉睦), a sword tester for the bakufu in fifth generation, tested the Ōtenta-Mitsuyo on bodies on the 19th day of the eighth month Kansei four (寛政, 1792). But such a cutting test is not mentioned in the documents of Maeda Harunaga (前田治脩, 1745-1810) – the then head of the family – and so it remains unclear of he made an exception for Yoshimutsu or if the latter had just made up this test because he was about to revive the name of the Yamada as sword testers and thus the testing of a famous meitō would have been beneficial to the reputation of his family. However, we have records that Hon´ami Jūrōzaemon (本阿弥重郎左衛門) was called in the third month of Bunka nine (文化, 1812) to the Edo residence of the Maeda family to give the Ōtenta-Mitsuyo a not further mentioned care or maintenance (teire, 手入れ). And in Ansei three (安政, 1856), the blade got a new polish by Hon´ami Kisoji (本阿弥喜三次) who wrote that this was the most difficult task in his entire life. The above mentioned Yoshimutsu wrote that with the first test, he cutted through a body in the area of the stomach. The second one went through the area just over the basin and in addition 15 cm in the clay base below. For test number three, the body was positioned sideways and the blow went through both shoulder blades, here too striking the clay where the bodies are layed for such cutting tests. The fourth and last test was done on three stacked bodies. The blade went with easy through the upper two bodies but got stuck in the spinal column of the third one. *1 Unfortunately no blades with date signatures are extant by the early Mitsuyo smiths. *2 Although the Genpei War started in the eastern Kantō area, it spread until western Japan, where at the Shimonoseki strait which separates Kyūshū from Honshū, the final and decisive battles were fought. 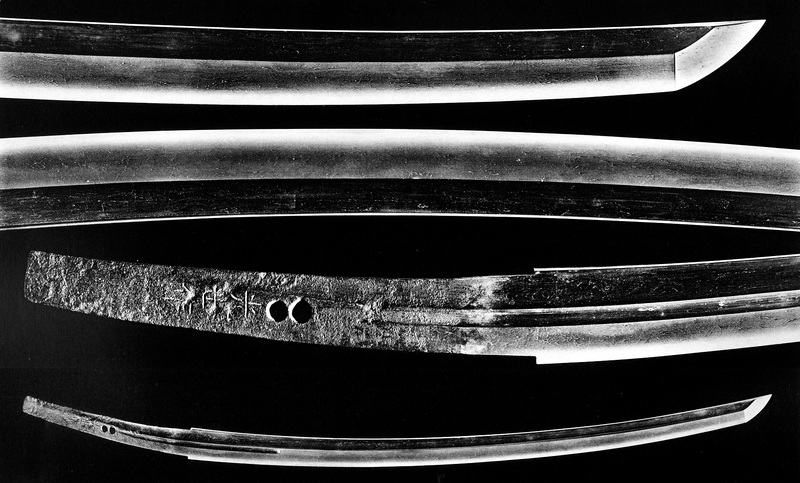 *3 This sword is mentioned in the Kyōhō Meibutsu Chō but its whereabouts are unclear. It is a work of the Bizen-Ichimonji smith Norimune. *4 Mataza or Matazaemon (又左衛門) was the child name of Toshiie which he bore before the coming of age ceremony (genpuku, 元服). Additionally, Hideyoshi was only one year older than Toshiie but they knew each other since early childhood. *5 Toshitsune was Toshiie´s fourth son but Toshiie´s successor Toshinaga (前田利長, 1562-1605) remained childless and so Toshinaga adopted his brother as heir and successor as daimyō of Kaga province in third generation. Toshitsune was after the Tokugawa the richest daimyō of the country and the adoption of Kametsuru by Hidetada was of course a political one to strengthen the alliance between the two factions. *6 The entry reads “shizu no naginata” (静の薙刀), but it is assumed that here a different kind of writing for the Shizu school (志津) of swordsmiths was used. Another theory says that the name goes back to the fact that the naginata was once in the possession of Shizuka-gozen (静御前), the favourite concubine of Minamoto no Yoshitsune.